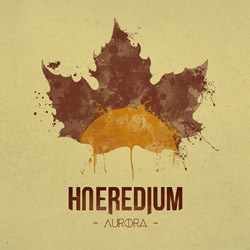 French folk metallers Haeredium from Alsace will release their debut full-length album “Aurora” on October 4th, 2014. Engineered at the Kid Studio in Ittenheim, France, mixed and mastered at the Denevér Sound Studio in Hungary (Dalriada, The Hellfreaks), the album “Aurora” is the result of several years of composition work, research and live experimentation on local and national scenes, that laid the foundations settled by the band at its beginning in 2009. An album with a colorful and surprising tinge, lyrics in French, English, German and unusual instrumentations (accordion, flute, mandolin or bouzouki) are the ingredients of this 100% self-produced first work.